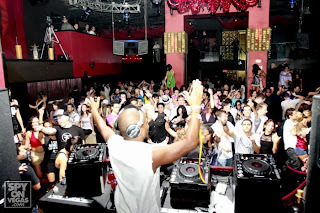 TAO GROUP BLOG TAO NIGHTCLUB LAVO NIGHTCLUB TAO BEACH LAS VEGAS: MORILLO!!!!!! VICE!!!!!!! WOW! What a night Sunday was (and Monday morning). With 2 great dj's on opposite ends of the musical spectrum in play Sunday night was GREAT. I started off at LAVO for Vice's first night. Perez and I had dinner with his weekend cohorts at LAVO, another amazing tasting menu. Next we went upstairs in the club for DJ VICE! VICE killed it, as always, Perez and I had a blast on the dancefloor. Next as Perez headed off to bed, I headed to MORILLO! After we closed down LAVO we met up with fellow superstar DJ BadBoyBill with a crew of 20 people and headed inside. The energy was off the wall as Morillo set was on fire. The club was PACKED at 4am when we arrived and we all mingled around. Wilmer Valderamma stopped through, and tons of industry peeps who got off work came by to close the weekend off. At 730am we called it a night with Morillo still going I was done. Erick ultimately played until 845am!